This Audio track includes verses from "Srimad Bhagavatam, Canto Ten, Chapter Twenty-One" and "Sri Krishna Namastakam" by Srila Rupa Goswami, among other wonderful slokas. 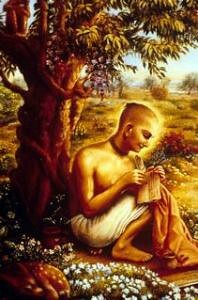 Rupa Goswami was a devotional teacher, poet, and philosopher from the Gaudiya Vaishnava tradition. 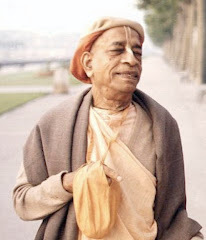 Alongside Sanatana Goswami he was considered the leader of the Six Goswamis of Vrindavan - a highly influential group of devotees made up from a number of disciples of Sri Krishna Chaitanya Mahaprabhu. Rupa Goswami departed from this world in 1564 CE and his samadhi (tomb) is located in the courtyard of the Radha-Damodara temple in Vrindavana. * Bhakti-rasamrta-sindhu: (The Nectar of Devotion) Bhakti-rasamarta-sindhu can be considered to be one of the most important books in Gaudiya Vaishnavism. In this work, Rupa Goswami elaborately describes the gradations of bhakti from its lowest stage of sraddha (faith) up to its highest stage of maha-bhava (ultimate ecstasy in love of Godhead). 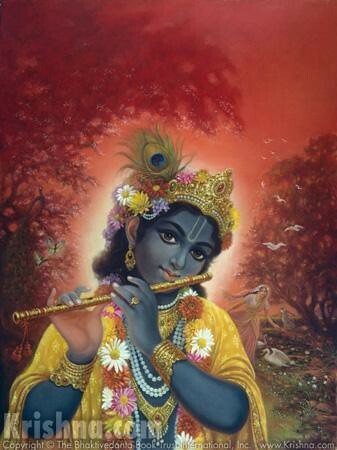 * Upadesamrta: (The Nectar of Instruction) This is a short work containing eleven verses that gives instructions to aspirants on the path of devotion to Krishna. The Upadesamrta was originally a part of the Stavamala. * Ujjvala-nilamani: (skt. The Sapphire of Divine Love) This work exclusively explains the conception of madhurya-rasa (divine conjugal love). Ujjvala-nilamani is considered to be a sequel to the Bhakti-rasamrta-sindhu. * Laghu-bhagavatamrta: (Skt. 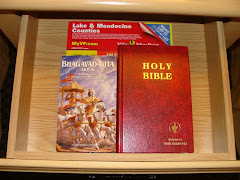 A Summary of Nectar about Godhead) The Laghu-bhagavatamrta is a summary of Sanatana Goswami's book Brhat-bhagavatamrta. 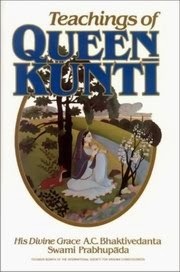 The book begins by explaining the intrinsic nature of Krishna and his incarnations and continues to deal entirely with the devotees of Krishna. * Stavamala: (Skt. The Flower Garland of Prayers) This is a compilation of short works by Rupa Goswami, some of which are often published as separate books. 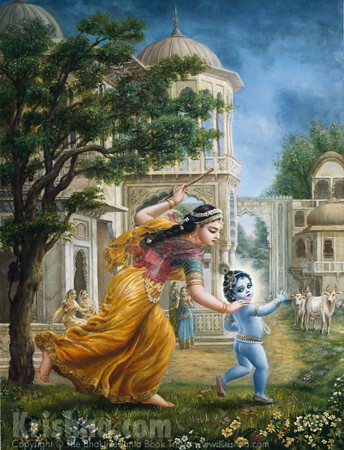 * Sri Radha-krsna-ganoddesa-dipika: (Skt. A Lamp to see the Associates of Radha-Krsna) In this book, Rupa Goswami lists the associates of Radha and krishna and describes their characteristics. This work was written in 1550 CE. * Danakeli-kaumudi: (Skt. 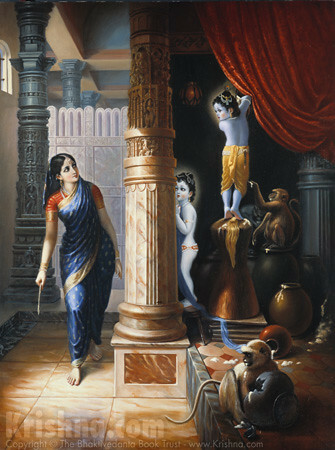 The Lotus-like Tax Pastimes) This drama was written by Rupa Goswami in 1549 CE and narrates the 'tax-collecting pastime between Krishna and the Gopis of Vrindavana. 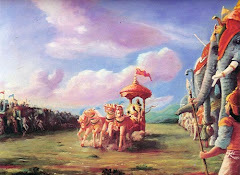 * Mathura-mahatmya: (Skt. The Glories of Mathura) The Mathura Mahatmya tells the glories of Mathura, in the form of a conversation between Varaha (the boar incarnation of Vishnu) and the Earth Goddess. Rupa Goswami explains various processes of devotional service by quoting statements from various Hindu scriptures and establishes that Mathura vanquishes all one's sinful reactions and awards piety and liberation. * Uddhava-sandesa: (Skt. 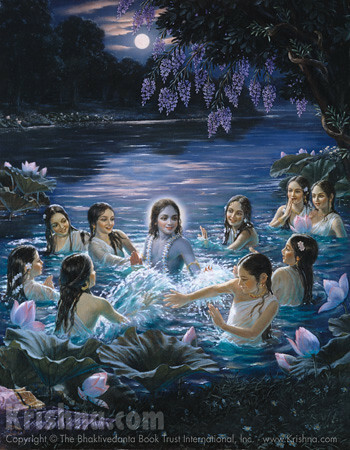 News of Uddhava) In this work, Rupa Goswami narrates the story from the Bhagavata Purana of Krishna requesting his friend Uddhava to go to Vrindavana and pacify his friends and relations by reminding them of their pastimes with him. * Hamsa-dutam: (Skt. The Swan messenger) The Hamsaduta tells the story how Lalita, the confident of Radha, sends a messenger in the form of a swan to Krishna in Dwaraka. * Sri Krsna-janma-tithi-vidhi: This short work of Rupa Goswami's is a paddhati (manual on ritual worship) explaining the process of worshiping the deity of Krishna during the festival of Janmastami, the birthday of Krishna celebrated by Vaishnavas in August/September. * Nataka-candrika: (Skt. 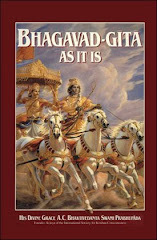 The Illuminating Moon of Dramatics) This book explains the rules of Gaudiya Vaisnava dramaturgy.